At the end of 2013 they started rebuilding the Queen Elisabeth Hall into a modern theatre and concert venue and congress facility, which will continue under the name of Elisabeth Center Antwerp. The building consists of four different facilities: the Queen Elisabeth Hall, an accommodation for the Royal Flemish Philharmonic Orchestra with offices and rehearsal rooms, the congress centre and the existing halls: Marmer Room, Darwin Room, Verlat Room and Wintertuin. The Royal Flemish Philharmonic orchestra will be “artist in residence” with 45 concert days and 100 rehearsal days. As sub contractor of THV Elisabeth and main technical contractor Putman Theatec, FACE was assigned to integrate all audio and lighting equipment next to an impressive and huge AV wiring infrastructure. As general AV consultant the design was specified by Charcoalblue, under the direction of Paul Franklin. As well as assisting the architects on the design of the principal room, Charcoalblue advised on the general planning of the building and designing the theatrical technical systems – stage lighting, audiovisual and stage engineering. The Queen Elisabeth Hall is a floating hall above the Atrium and has more than 2000 seats. To improve the acoustics which only had a score of 60%, the hall is fully rebuild according the design of the British Architect Ian Simpson. They worked together with Kirkegaard Associates to let the hall exceed in terms of acoustics. The hall has a shoe-box design, completely driven by the acoustics, to resonate the sound perfectly. There’s no fixed front stage so sound loss is eliminated. Moveable reflection panels are placed above the orchestra area to create variable sound projections. Lava isolated walls covered with undulated oak wood panels provide a perfect balance between reflecting & absorbing surfaces. 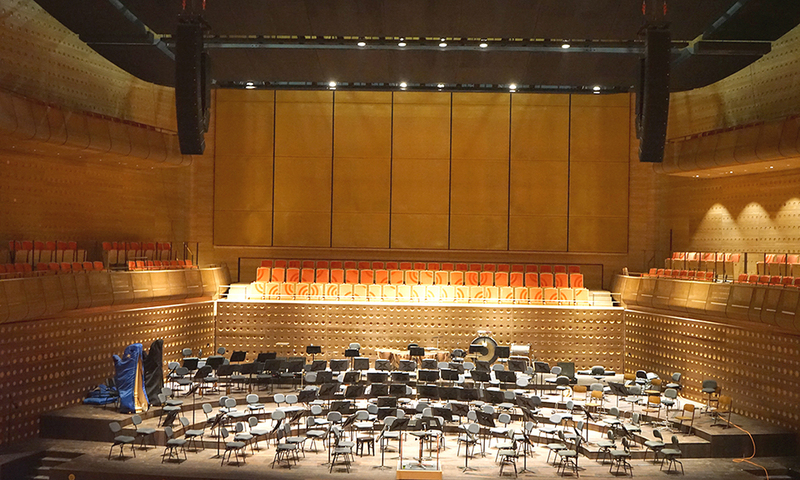 To become one of Europe’s top of the league concert halls, the choice of the speaker system was very important. Steven Kemland, FACE’s Project Division Manager chose Renkus-Heinz VARIAi as main FOH arrays, flown on either side of the stage. The Left and Right arrays further comprise flown VAX15 subs and conventional RHX81 speakers for the side balconies, ensuring a 270° audio coverage for each cluster. “Throughout the whole process, engineers of Renkus Heinz have been thinking along. They drew up the original ease-design and did the first simulations for the placement of the speakers in cooperation with FACE,” adds Steven Kemland. The mobile wedges consist of a mix of Martin Audio LE1200 and DD6 wide angle enclosures. FACE installed 26 customized versions of the Renkus Heinz CFX41 stair step speakers in three rows, because the stage is divided in three moving stage elements, tailor made for the Philharmonic Orchestra. To complete the venue lay out, two additional DRS218 subs and two extra VAX101 array modules are added as mobile infill as well as three RHX101 delay speakers for the upper balconies. In addition to the FOH system, FACE installed an integrated speech system consisting of Renkus Heinz Iconyx IC24 on either side and two IC8 loudspeakers for the side balconies and choir wagon. When using the speech system, the FOH front-fill and delay speakers are used as well. When the speech system is in use, the VARIA arrays are lifted above the moveable reflection panels and are hidden in the stage grid. For amplification, FACE choose the Powersoft X8, X4 and Ottocanali series with a Peavey Media Matrix NION, all equipped with Dante networking cards. Processed by the Powersoft Armonia software platform, it allowed us to integrate a complex set-up with a very user-friendly interface. In the different congress spaces and the general paging system, Martin Audio CDD5 and CDD8 in combination with C4.8T and C6.8T ceilings speakers are used as main audio system, which are also amplified by Powersoft Ottocanali and processed by a NION set-up of Media Matrix. The Queen Elisabeth Hall is fully equipped with an Ampetronic hearing loop system which is IEC-approved and greatly reduces background noise, competing sounds, reverberation and other acoustic distortions that reduce clarity of sound. 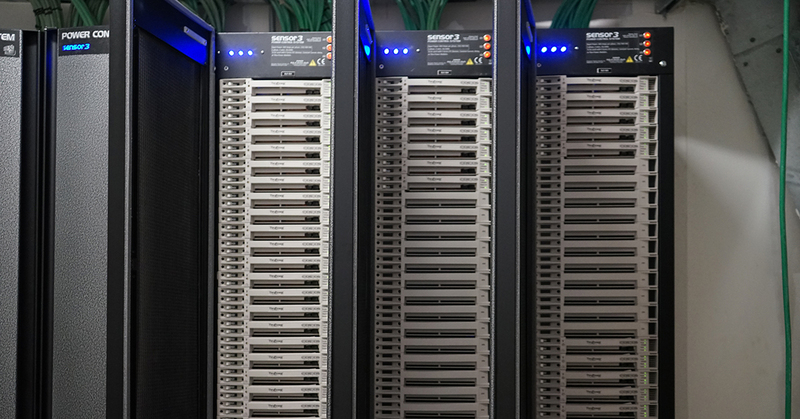 All audio equipment is combined in one huge Dante network, which controls and connects all digital audio signals for both the main system as well as all other zones in the building. To lighten up the venue, fixed stage and house lights as well as the work lighting in the building were provided and installed in close cooperation with architectural lighting manufacturer ETC. 520 dimmer channels for the production lights were installed, all with ETC Sensor3 racks and modules and the option to use all channels for dimming or switching. The network is controlled based on the sACN network protocol. sACN is a multicast protocol which ignores other protocol signals so there’s less overload on the network which secures a very permanent signal. To operate and control the system, FACE installed an ETC Gio console for show control and a complete Paradigm network with more than 60 control points and touch screens for building control management. The ETC Gio has a fast, accessible control surface, with an easy-to-navigate backlit keypad. The Gio has a tidy footprint that can handle shows of any size, used in a lot of equal and renowned theatre facilities like The National Theatre in London and the Deutsche Oper in Berlin. The ETC Paradigm System is controlling all other lights like the hall and work lighting as well as lighting in all technical rooms. The Paradigm gives the ability to have dedicated presets for every single venue like backstage, stage left and right and rehearsal rooms as well as every application from a pop concert to an opera. The technician can prevent people of putting the wrong lights on during a show. The Elisabeth Hall has 90 fixed Source Four PARs as house lights build in. 60 Source Four Frenel and 30 Source Four Profile 10° and 14° fixtures are build in. These lights are basic lights which operates for the Royal Flemish Philharmonic orchestra. Through automation the concert hall can fast and easy be adapted to various productions, which can have their own lighting fixtures due to a complete fixed wiring infrastructure. In addition, FACE installed the GDS BluesSystem as reliable dimmable working light for backstage, corridors, stairways, grid area and flying rooms. Those compact LED lights have various fixtures and different dispersion and are also DMX controlled through Paradigm. The Paradigm system will control the fixtures via presets. The Paradigm provides a dimmer switch on all channels which means you can switch between a dimmer function or fixed power. The venue has a lot of external productions and by preproduction, the technical crew can prepare the venue for all guest productions. The technicians of the visiting crew can easily manage the lighting fixtures due to the presets of the Paradigm. In addition to the sound and lighting infrastructure, a brand new ASL Flexus digital intercom was deployed for all communication. With 16 wired beltpacks and a coupled wireless Clearcom Freespeak, all kind of productions will experience the benefits of the in-house communication system. A custom-designed Stage Manager Console of GDS operates as the master control for all communication. For a proper connection between all systems, FACE installed an impressive length of audio and lighting cable, adding up to over 100 kilometres in the main venue alone. 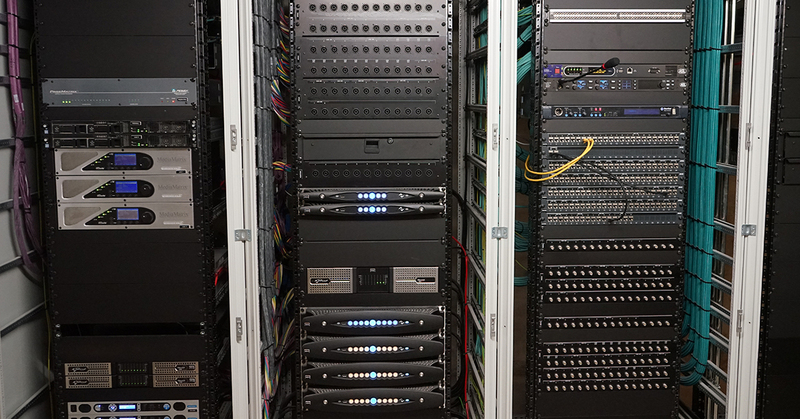 For almost a year, a dozen of FACE technicians worked continuously to install the complete audio-visual cabling. Van Damme low smoke halogen-free cables are used for every signal and over 180 custom made AV connection boxes are specifically designed and build by FACE’s project team. The network consists of Fiber and Cat6 ethernet cabling for the audio network, cue lights, DMX and intercom which makes the whole installation futureproof. All DMX distribution in the venue is done by Luminex. 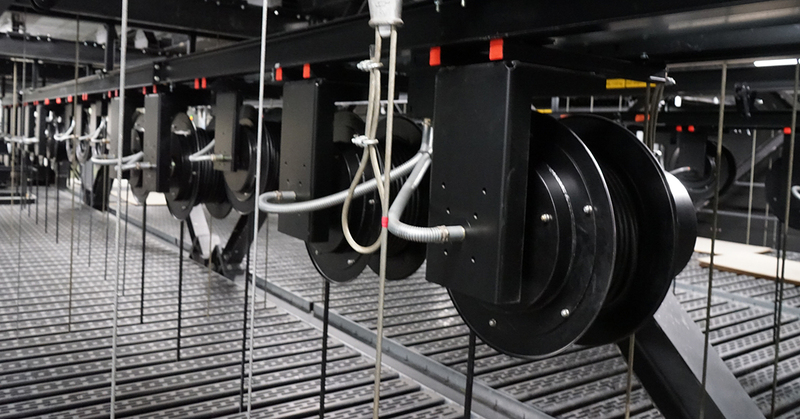 A total of 46 Cable reels of Meetool are taking care of the transport of the lighting bridges, which are all provided with power, DMX, audio signals and network connections. The new Queen Elisabeth Hall opened successfully the 26st of November 2016 and will house several concerts, musicals and performances like concerts of the Royal Flemish Philharmonic Orchestra, the musical Cats, ballet performance Tchaikovsky’s Swan Lake and German electro pioneers Kraftwerk.